Although not a brewery or brewpub, a beer bar is also a quintessential - nay essential - part of any beer fan's environs. A good beer bar has some different brews, and offers decent food at a fair price. A great beer bar has some more unusual brews, and very good food; in some cases near-gourmet quality. A gratifying beer bar has rare and unusual beers, and food that in some cases is off the hook. 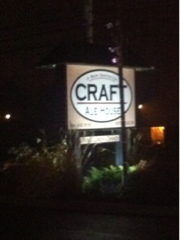 I would estimate the Craft Ale House in Royersford Limerick PA falls into the 3rd category - or higher. As with this apparently water-themed beer trip, this is where Mr. Royer "forded" (crossed) the river. The bar - as the story goes - was originally an unassuming deli, which a husband-wife team bought and rehabbed and thus the Craft Ale House was born. They have at least 15 taps which change periodically, they have very good food, and they have beer. First the food. There were four of us at the restaurant; three chose the grass-fed hanger steak and I chose the smoked boar. I am not sure what was better. The boar was tender, rich and smoky, served with Brussel sprouts. The hanger steak was fork-tender, with bacon-accented collard greens and fried mashed plantains. There is a tempting dessert menu, but there's no better aperitif than a good barleywine. Now the beer. A breathtaking array of beers in two coolers (with allegedly "more in the back", and there were) from A to Z. A good example is the fact there was van Eecke's Hommeil beer, a personal favorite. The list of beer sampled - as I was not driving - is just a hint at the selection. Had a nice chat with co-owner Gary, and me tipped us off as to another potential beer importer to speak with, after my own abortive attempt to import beers from Belgium. So, remember, if you're within 50 miles of Royersford - and Craft Ale House is open - you really owe it to yourself to stop in. Glad you liked it, but it is located in Limerick, not Royersford.